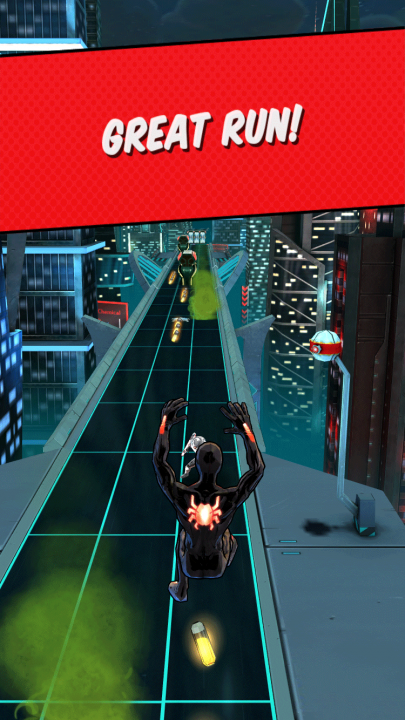 Gameloft‘s Spider-Man-themed endless runner is a roller coaster experience. It draws you in with high production values, sporting incredible visuals and voice acting that are faithful to the comic hero’s brand. A fun collect-’em-all character system and tight, responsive gameplay keep you excited and eager to play round after round. Then you hit a wall, where things get stale and progress becomes a grind. But if you’re willing to push past this phase with part luck and part skill, the game eventually does a great job recognizing masterful play with excellent rewards. 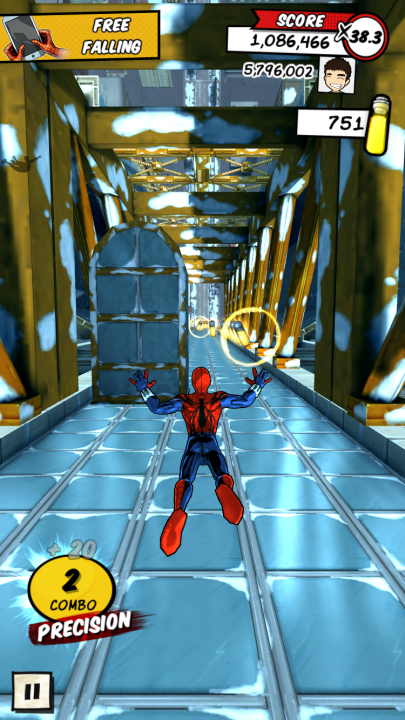 Spider-Man Unlimited grabs your attention right away with a boss battle vs Green Goblin that teaches you the gameplay basics. Run forward, avoid obstacles, collect vials (in-game currency). It surprises you a little with the web swinging, wall crawling, and free falling segments, controlled by tilting your device instead of the mostly swipe and tap interactions. These gameplay moments really help to solidify the feeling of being Spider-Man. You only have a few Spider-Men on your roster with low score multipliers, but it’s possible to progress at a reasonable pace unlocking new characters and missions. The game has already started pulling you in until after a few more hours, you hit a snag. Frustration creeps in with not much to do. 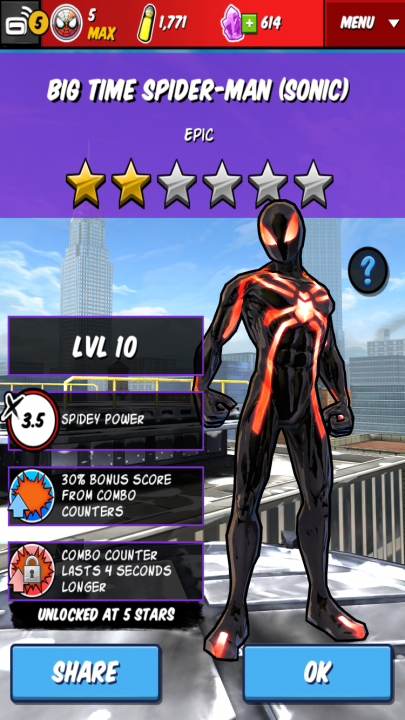 You’re required to have ever-increasing score multipliers to progress through the story or be competitive on the leaderboards, but the limiting factor is the RNG of ranking up your Spider-Men. ISO-8, the premium currency, is very difficult to obtain. It’s also the only way to get anything valuable, since the vials only buy you lower tier characters that aren’t worth much. In addition to these pain points, the game limits you with an energy resource which only allows a max of 5 runs before they recharge (at 1 energy per 10 minutes). With some luck pulling better characters from premium portals, the game deserves a little more time. However, you’ve also probably been getting better at reacting to the various obstacle patterns, and maybe been able to grind out a few nice bonuses from events. At this point, events are the best way to earn rewards without relying on random chance. Slowly you can start to build a decent collection of 3-5 star Spider-Men of rare quality or better. With some luck pulling better characters from premium portals, the game deserves a little more time. Combos. Combos are key to getting the most out of each run. They’re achieved by performing precisely — dashing away from an obstacle at the last second, swinging gracefully through floating rings surrounded by lasers, defeating enemies that suddenly block your path. As you start to recognize the game’s stage patterns it gets easier to string together bigger and bigger combo chains. This makes your score jump tremendously which results in more premium currency, more event goodies, and more story mission progress. It’s still somewhat of a slog, but a slog with potential. It’s like the tip-of-your-tongue phenomenon. You feel like you’ve got something but can’t get it out. With this much dedication to the game, the rewards arrive in spades. You feel a sense of flow while playing, perfectly executing runs while rarely dropping the combo counter. You can finish the “endless” Unlimited mode — yes, finish it. Unlimited mode automatically stops you after defeating 7 bosses with a triumphant “Great Run!”. Only an hour or so of play can potentially net you a sizeable chunk of ISO-8, maybe even some free portals. And even though this part of the review is labeled as 20 hours, this time investment likely is (and should be) spread out over a few weeks. 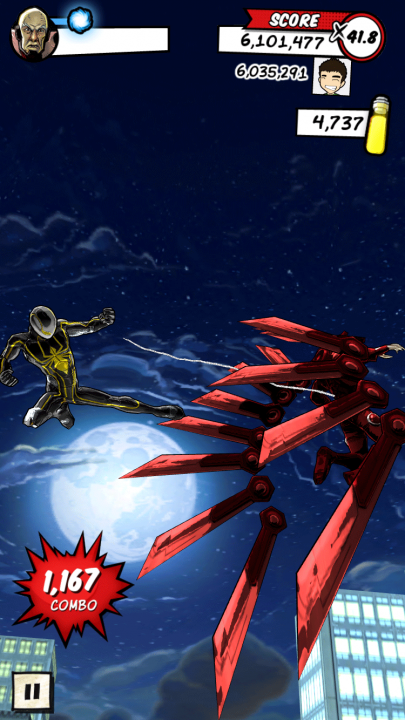 With some persistence and patience, Spider-Man Unlimited is a game that gets free-to-play design right.